For many of us, the first lesson about the cruelty of nature is this well-worn canard: If a baby bird falls out of a nest, don't touch it, no matter how sad and helpless it looks. Your smell will then be on the bird and the mother won't take care of it anymore. Whether or not this is true (it's not) doesn't matter because there's still an important lesson here: If you interfere with nature, you will almost invariably do more harm than good. It seems like a father and son visiting Yellowstone never got that message and now a baby bison is dead. 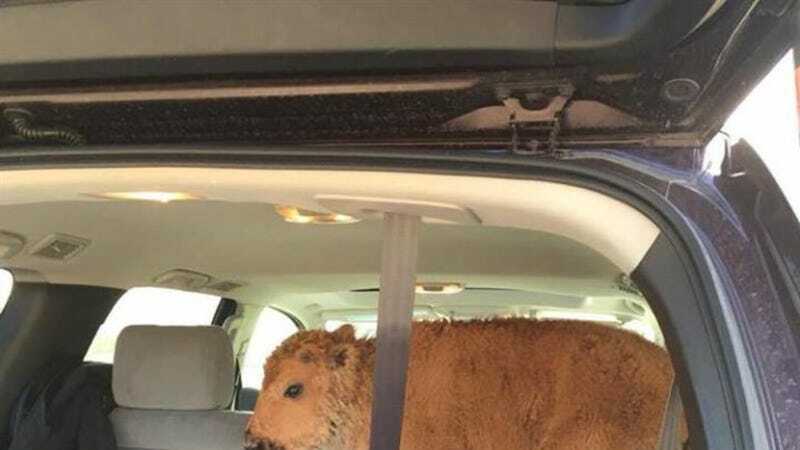 Over the weekend, fifth-graders on a field trip to the park were subjected to the surreal sight of a man driving up to a ranger station with a newborn bison in the back of his SUV. According to Karen Richardson—a chaperone on the field trip who ignited an internet backlash when she posted images of the event—the father and son got out of the SUV and demanded to talk to a ranger because "they were seriously worried that the calf was freezing and dying." It's hard to imagine how bison have been getting along for millions of years without this guy. Rangers ticketed the man and let them go, citing "misplaced concern" in their report. Unfortunately, when rangers tried to re-unite the baby bison with its herd, it was rejected. According to a statement from Yellowstone, "The bison calf was later euthanized because it was abandoned and causing a dangerous situation by continually approaching people and cars along the roadway." This is just the most recent example of incredibly dangerous and foolish behavior at Yellowstone in recent years. Rangers have repeatedly issued statements to visitors that the minimum distance to keep from an animal is 75 feet, which means NO SELFIES. You may recall bison making the news a few weeks ago when they were named the national mammal of the United States by President Obama's signing of the National Bison Legacy Act. This incident makes for a rather ignoble inauguration to that position. While National Parks are amazing educational resources, they're also dangerous places filled with dangerous animals. Perhaps people need to be better educated prior to entering Yellowstone in the first place.